General Observations: In general, October brings a much slower pace of crop growth due to diminishing light levels and a significant drop in daily high temperatures. During this October in particular, the late season rains that never showed up in September came in full effect. The full list of fall crops are maturing in the field, while the last succession of crops for late November markets have been planted by the middle of September. With the cover crop on the soil surface, significant rains settle the seed and promote germination. Equipment (28 hrs): The final field succession of fall crops was planted in furrows in Veg B north. 6 furrows were planted in the first week of the month. The crew noted that this succession was planted one moon too late to reach maturity for the last two markets of the year. The remaining equipment hours mentioned came as a result of prepping and planting fields into cover crop. Administration (60.5 hrs): Reviewing important tasks such as maintenance of the irrigation systems becomes important as night temperatures drop well into the freezing range. With an increase in cold rainy days, office work becomes much more enjoyable. The typical tasks of payroll, bill paying and other accounting activities comprise the majority of these hours. Infrastructure (170.5 hrs): October typically marks a time when significantly less worker hours are spent harvesting. Summer crops and flowers die from frost and crops begin to grow much slower than in the warmer summer months. Tasks which will benefit the farm in the short and long term can be focused on as more time is spent away from the production fields. Cleaning up production fields by removing/storing irrigation lines, submain lines, hoops and remay typically requires a significant amount of time with the whole crew involved. Greenhouse (58.5 hrs): Preparing greenhouse gothic for early winter vegetables required several work blocks from the crew. The standard procedure for prepping a hothouse for production involves shaping beds, prepping them (broad forking, tilling and raking), seeding and covering them with appropriate materials for season extension (hoops over remay cloth). The remainder of the hours finishing high tunnel construction fill out the rest of these hours. Composting (23.5 hrs): The final compost order for the year is applied to the fields in the first days of the month. 8 field furrows in total are composted. Completing composting in the greenhouse gothic for early winter production rounds out the composting hours logged. Planting (81 hrs): As stated above the final field succession of fall crops was planted into 6 furrows in veg B north. Crops transplanted included fennel, kohlrabi, cabbage, beets, kale and chard. The crew logged this planting as likely being one moon/month too late to receive the best product possible from the seeds planted. Despite the fact that the number of days to maturity match the number of days to market, the decreasing sun levels cause the crops to grow at a significantly slower pace during the late fall months. The final plantings in greenhouse gothic (10/23) consisted of mesclun mix and other fall crops (turnips, radishes, kale, chard and brocolli). Crop Care (125 hrs): During October maintaining weed-free production blocks is less of a concern as the first hard frosts take care of the majority of the most aggressive weeds. However, cultivating and hand weeding crops under row cover is still a priority especially for the crops destined to be harvested in the last weeks of the season. Mesclun mix is also important to keep generally free of large weeds as it can be quickly overgrown, making harvesting with numb fingers a problem. Aside from cultivating established and recently planted crops, the majority of these element hours consists of either putting on row cover or cleaning/storing row cover. Harvesting (263.5 hrs): As usual, these element hours are nearly half of September. With the frosts impending, the final harvest of summer crops and flowers keep the crew in a bit of a rush. However, the harvest rush in comparison to the middle of August is a cake walk. With cool, moist weather the rush to get post-harvested product into a cooling tank is less urgent. The remaining big garden beds of carrots are harvested for storage. This often takes a full four hour block with a full crew at hand. An interesting note unique to 2014 was the attempted seed saving of Costata Romanesco squash. This being an heirloom crop, the seeds will come ‘true to seed’ if isolated from other squash varieties (to prevent cross pollination) and preserved effectively. Handling (60 hrs): With a drop in temperatures and late season rains being the norm for October, market customers tend to drop dramatically after September ends. For this reason less product need be harvested and washed. Nevertheless, washing requires a significant amount of time for one or two people in the crew per week. This is especially true for washing mesclun mix which requires a good deal of time cleaning and packaging. Marketing (170 hrs): The entirety of these hours are spent at weekend markets. The market totals for October 2014 were 9,000 dollars less than in October 2013. Some reasons to describe this significant lack of profit are the lack of mushrooms at market (only thirty pounds purchased per week in 2014) and the fact that there were only three market weeks in October of 2014. Special Projects (55 hrs): The majority of these element hours for 2014 were spent either maintaining the high tunnels constructed in the spring or preparing the next area destined for high tunnel construction. Digging drainage areas and post holes becomes an area for construction lessons for the trainees. Weather: Rain and killing frosts came in full effect during this month. After a particularly dry summer, irrigation is put as a secondary priority for the first time all season. Protecting crops from frosts becomes the main task for maintaining the viability of market products. Week 1: The first week brought a deep soaking rain which was desperately needed. Week 2: Cool day temperatures and night temperatures in the 30’s bring an end to summer crops. Week 3: The beginning of the week brought the first hard frost with temperatures in the teens. 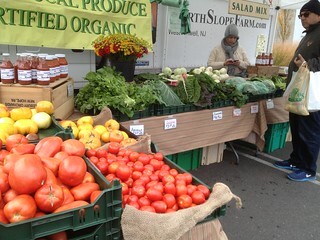 Week 4: The week ends in cold temperatures and a cutting wind for the last markets of the month. General Observations: During September the usual rush to harvest summer and fall crops for each market keeps the crew busy. However, despite the weekly market rush, a tangible drop in tension arises with the first days of the month. The cover crop plans are drawn in detail and field preparation puts planning into action. Seeing the land transform from stress invoking production blocks to a carpet of grain, destined for a year of rest, puts one’s mind at ease. Equipment (53.5 hrs): Field preparation for planting cover crop comprises the majority of these hours. After production, debris is cleared from the field and the field is disked, seeded and raked via tractor implements. This procedure was done in two fields (veg a north and veg b north and mid). Two hay fields (Veg C & 579 north) were planted with cover crop for future plans. These fields required mowing, several passes with the disc implement, seeding, raking and rolling. Administration (38.5 hrs): These element hours are primarily a result of the payroll completion. Monthly summaries for the 2013 calendar year were completed and trips to acquire fresh fruit for market rounded out the remaining hours. Infrastructure (85.5 hrs): Standard upkeep of farm properties requires a significant number of hours to maintain a useable space, especially at the end of summer when wild plants are reaching full maturity. Training on primary tillage becomes a major priority when the late season rains begin to pop up in the forecast. In this process, tractor usage is described in detail. Implement attachment points and the hydraulic mechanisms used to operate them are described. Tillage implements are described and put into use to demonstrate for trainees. Greenhouse (24.5hrs): Constructing the end walls of the previously constructed high tunnel frame leads to several lessons in construction for the trainees and a handful of work blocks for those involved. Composting (16 hrs): Composting via compost spreader and spreading by hand (atv trailer and shovel) are the normal preparation procedures for the field furrows and big garden beds respectively. For tight areas inside of hothouses, wheel barrows are filled and distributed evenly over the pre-formed beds. Planting (45.5 hrs): This element was reduced by 120 hours from September of 2013. The majority of these hours result from planting in the big garden beds. Only one field succession was planted during this month. Typically, late in the summer, big garden beds are direct seeded while the field furrows are prepped and filled with transplants. In September 2014 only one succession of fall crops was transplanted into furrows. Also, direct seeding is inherently less time consuming than plugging in transplants. 2 big garden beds were prepped and direct seeded on 9/10 with mesclun mix. Also on 9/23, 3 beds of mesclun mix, 2 beds of tatsoi, 1 bed of arugula and 3 beds of roots (turnips & radishes) were direct seeded. An interesting note about planting times; the crew noted the final seeding of carrots being 9/4 in 2013. Crop Care (153.5 hrs): Being only second in element hours to harvesting, crop care requires a large deal of crew hours. Thankfully, when many hands are on a job the work becomes light. Never the less, keeping crops free of competing weeds becomes a major drain of the crew’s time and effort, especially when hand weeding is involved. The completion of production in field blocks requires a good deal of cleanup especially for crops like tomatoes, which require trellising. Additionally the use of season extending fabrics requires hoops and sandbags for securing the material. With the season heading deeper into fall, covering fall crops becomes the main priority to maintain a diverse display at each market. Harvesting (475 hrs): Harvesting is always the major priority for the crew when weekly markets are in full swing. The month of September in particular is the time when the greatest diversity of food is available on any small diversified farm. Fruit, summer vegetables and fall vegetables are either maturing to full flavor or are only weeks away from maturity. This results in daily harvesting especially for rapidly maturing summer crops like snap beans, summer squash and tomatoes. Handling (86 hrs): Washing Thursday harvests (greens and roots) and mesclun mix on Fridays results in the bulk of these element hours. Efficiency is a must for any grower when harvesting in the heat of summer. To ensure a reputable product is brought to each market, greens must be picked and bunched as expediently as possible to ensure rapid transition to cooling. If this is not done with haste the crops will look unappetizing to say the least. Marketing (112 hrs):As mentioned previously, the full gamut of farm products are available during the month of September. For the market gardener and any small farm for that matter, being able to effectively market one’s farm products is crucial to generating income. In this way the grower can capitalize on the work involved in growing and maintaining the plants. This is especially true with perennial crops which can vary greatly in yield from year to year. Flowers have also proven to be a very profitable venture. This crop in particular serves many functions. Flowers generate significant income if marketed effectively. They also provide a significant amount of pollen for wild pollinators. This inevitably draws beneficial insects to production blocks. These pollinators influence flower fertilization and can reduce populations of crop damaging insects via parasitism and predation. Special Projects (11 hrs): Work in the newly constructed high tunnel results in the element hours mentioned. Weather: Overall, this month was mild but very dry, with no substantial rain (≥ ½’’) the entire month. Week 1: Conditions remain in the 80’s to 90’s during the day and in the 50’s at night. Week 2: Conditions are similar to the first week with still no rain in sight. Week 3: Dry weather prevails and irrigation remains an absolute necessity. Week 4: Dry mild days begin to give way to cool nights in the 40’s. Heavy dew blankets the ground each morning but no extreme weather to mention. General Observations: Overall, this month was much more mild than normal with a dry beginning and a mild ending. TH in charge of crew during first week while CH and MR on vacation. Cover cropping placed as a significant priority. MR determines seed order with crew by preparing planting map. 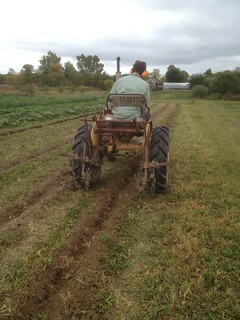 Crew begins experimenting with favorable furrows when planting remainder of summer crops and beginning of fall crops. Markets down significantly from previous year (-$6,000) due to less fruit (blue and blackberry) sales. Also a notable and ongoing problem is the mexican bean beetle population increasing throughout summer. Aside from the usual weekly markets the crew spend the height of tomato season sorting tomatoes for processing. Equipment (15 hrs): These element hours were reduced by 10 from the previous year and 70 hours from 2012. This was a result again of loose record keeping by machine users. For example on 8/12, a day in which 4 favorable furrows were ripped, composted and planted no machinery usage was logged. Furthermore, furrow preparation has proven to be an expedient process with the equipment available and may have had some influence in the reduction in equipment hours mentioned. (8/12) First years were trained on Kabota mower usage. (8/16) MR took moldboard plow to unruly 579 field to plant into hay. (8/22) Favorable furrow preparation in veg b north allowed crew to proceed with planting of fall crops. Infrastructure (45 hrs): Standard mowing of the farm properties and various livestock requirements comprised the majority of these element hours. (8/14) MR used haybine to cut wild crop of ragweed smothering red clover in Central South East North Field in preparation for cash crop planting in 2015. (8/28) The walk in cooler was cleared of summer produce to make room for fall storage crops. Crew estimates close to 100 pounds of summer squash were composted or used for livestock feed (8/29) Cover crop seed order placed on 8/9 was picked up and a stored for later use. Greenhouse (26 hrs): (8/12 + 8/13) Full crew trim and trellis tomatoes in high tunnel 1 and ralph’s house. (8/16) Some of the last seedlings to be transplanted in the fall are seeded by CH (8/27) Trellising the greenhouse tomatoes in the aforementioned high tunnels is a priority with maximum fruit output occurring. Composting (23 hrs): Planting of the final summer crop successions and the first of the fall crops results in quick usage of compost orders. (8/10) Furrows are prepped in Veg B north in preparation for fall crop planting, while the western big garden beds are planted with various crops. (8/22) Crew focuses on large planting of western big garden beds in preparation for large rain forecast. (8/26) The last rows of summer squash and green beans are composted for planting. Planting (46 hrs): Planting the final summer crop successions and the beginning of the fall crops helps the crew remember that there is a light at the end of the tunnel. (8/5) Two big garden beds are prepped for direct seeding of salad mix. (8/12) Fall crops (ie: mizuna, collards, fennel, kohlrabi) are transplanted in favorable furrows of veg B north. (8/21) MR discusses preparation for garlic planting which will occur later in the year after the first frost. 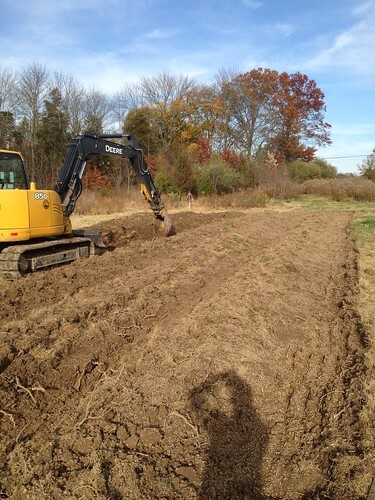 220 foot field beds are to be planted with cloves spaced 5 inches apart. In total 6 beds need approximately 3200 cloves for a full planting. (8/22) The western big garden beds were prepared for planting. Hakurai turnips, arugula and tatsoi were direct seeded into the northern beds, while 3 beds of carrots, 2 beds of salad and one bed of radishes were direct seeded in the southern beds. (8/26) The final planting of frost tender plants were seeded into favorable furrows (1 row summer squash, 2 rows of beans). Crop Care (160 hrs): The maintenance of existing summer crops is usually of slightly less importance during august. Fall crops in infantile stages require the most attention to maintain growth in what is typically a hot and dry environment. In this process, old field successions are cleared through mowing and/or tillage and either a cover crop or a cash crop are planted. Our main cash crop; tomatoes, require significant attention during august to ensure the plants are trellised and mulched properly (8/11) An old flower succession was cleared of trellising equipment and mowed off using the billy goat. The Kabota mower was also used to mow off the strawberries and hay in the field adjacent to 579. (8/12) TH rototilled pathways of central southeast north field to knock down grasses encroaching on cash crop. (8/13) High tunnel tomatoes were clipped and trellised by the crew. (8/20) A very dry period prompts irrigation. A rotation of two zones per day provides sufficient water to crops without overwatering. (8/27) Cash crops direct seeded in the big garden beds (ie: lettuce and carrots) are all hand weeded. Hand weeding comprises a significant portion of crop care element hours as full crews are typically involved. Harvesting (359 hrs): Harvesting hours increased by about 100 hours from last year. Poor yields and efficiency seemed to reduce overall harvest time for 2013. During this peak time of production the main priority is maximizing yield through timely harvest. Both hothouse tomatoes and field tomatoes provide their full flush of fruit and other crops like squash require two pickings per week. Flowers are a valuable commodity for any diversified farm as the crop generates valuable income while attracting beneficial insects to surrounding cash crops. 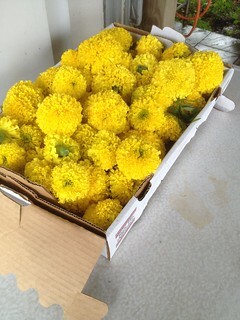 Aside from flowers, greens and salad are harvested on mornings prior to market. Handling (70 hrs): Hydrocooling/washing of crops requires a significant amount of time throughout a single month. To ensure no leafy greens are wilted in the heat of the summer, greens are harvested and promptly cooled through washing. Egg washing by first years and garlic cleaning after harvest round out the remainder of the hours not accounted for by washing. Week 1: Week begins with rains saturating the soil, but conditions remain clear and dry for remainder of week. Week 2: Hot and dry conditions prevail and irrigation needs must be tended to sustain all crops in production. Week 3: Conditions remain dry but cooler days with highs in the 80’s offer a brief respite from usual august conditions. Week 4: First real rain in three weeks comes in the beginning of the week and is followed by another two days later. Conditions for the rest of the week dry out but cooler conditions prevail. General Observations: With New Jersey looking more like the Arctic Circle than the garden state the crew began the month by repairing the collapsed farmhouse gothic through somewhat unconventional methods. After greenhouse repairs were complete the crew shifted its attention to the overcrowded chicken coup. Following these pressing matters, perennials were pruned and greenhouse planting successions were completed despite freezing nights and strong winter winds. With low temperatures well below freezing through the last week of March, thawing greenhouse irrigation was the main priority. Preparing the beds for planting with compost and minerals and moving the chicken coop brought an end to March and the last of the winter weather. Equipment (16 hrs): (3/17) Leaking coolant required repair of the JD 2240 after being used to repair the snow damaged farmhouse gothic. (3/26) IH 140 used to spread compost of 16 beds on the vegetable C south field at 1.5 yds³/bed. (3/27) Both batteries on JD required replacement after clicking noise and lack of engine turn over observed. Administration (146.5 hrs): (3/5) Roundtable meeting for crew to discuss personal interests, focuses and plans for upcoming season. (3/6) Completed farm summary of 2013 harvest data with brief comparison to previous year’s summary. (3/13) Seedling sales for market and Whole Earth Center were logged and the March 2013 summary was posted. (3/17) Farm manager joined Matt Conver from Cherry Grove Organic Farm at market meeting in Summit, NJ to discuss the market details, guidelines and liability insurance rates. A pallet of chicken feed was ordered from Lakeview Organics. (3/18) Third year focus, introduction and plan established (3/19) The final seed order from JSS was placed and brief review of seed orders was done. (3/20) Soil fertility introduction for this year’s crew was done with the aid of the previous year’s soil tests. The science of trimming fruit trees was practiced with varying degrees of success. (3/27) April summary completed. Infrastructure (124 hrs): (3/4) New toilet and shower fittings put in farmhouse for a total cost of $1250. (3/7) Chicken coop moved from chicken yard to Farmhouse Gothic for the time being. (3/12) With the first planting comes lessons of greenhouse operations involving irrigation, heating, ventilation and soil preparation/seeding. (3/13) Thawing of the greenhouse irrigation lines is the major task of the day as the culvert and drain valve are frozen. (3/21) The crew preps the new high tunnel area for construction. A drainage issue in Big Garden Bed south is noticed and furrows are cut to allow drainage. (3/26) Cold and windy temperatures brought inconveniences like freezing of the drain in the greenhouse which required 1.5 hours to drain. (3/26) Electric fences are put up around the chicken flock in the pasture to deter the family of foxes. Greenhouse (165.5 hrs): (3/4) Trimming of the greenhouse shade willows begins. (3/5) A major renovation of the Farmhouse Gothic is required after collapse due to heavy snow. 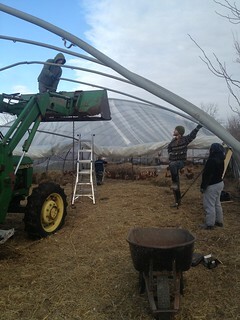 JD and the crew were required to lift the hoops and reform the greenhouse structure. (3/7) Ralph’s house beds were formed and staked out. Tomato strings and drip tape were all removed. (3/12) Greenhouse orders were created and the first day of seeding commenced. Onions, leeks and the first succession of vegetables were started. (3/13) Beets, cabbages and zinnias were all started. The farmhouse Gothic walls were all secured to protect the chickens from the heavy winds. (3/14) The entire first seedling succession has been started. (3/15) Heated mats and chimney repairs have allowed the greenhouse to reach proper germination temperature despite freezing temperatures outside. A single heavy watering at 1pm each day supplies ample water while allowing convenient drainage of the pipes so as to prevent freezing overnight. (3/23) Rodents mercilessly killed all the greenhouse sunflowers. Bells of Ireland and dill were planted to replace the sunflowers. (3/30) Post holes were dug and filled on the west end of the Farmhouse Gothic and lumber was inserted into the poured concrete. The remainder of the greenhouse was cleared to make way for the spring rush. Composting (31 hrs): (3/25) The Big Garden Bed Northeast Vegetable Field South (3 BGB’s and 4 Fieldbeds) had 11 yds³ spread at a concentration of 1.5³ yds/bed. (3/26) The vegetable field south had 1.5 yds³/bed spread over 16 beds. (3/27) Tree trimmings were collected by the crew and brought to the compost pile. Planting (19.5hrs): (3/12) First day of seeding with onions, leeks and first vegetable succession begins. (3/13) Planting continues with the beets, cabbages and zinnias all being planted. (3/14) First seeding succession is started for the time being. Extreme cold weather and hard north winds require heat mats and space heaters to ensure germination is successful. (3/20) After soil tests were complete a recommendation of 80#N/ acre or 2#N/1000ft² was decided upon. A change in fertilizer application was decided upon for the season. North Country Organic Natural 6-0-6 No-Phos application was applied ($26.35/50#). (3/25) Seeding for seedling sales and greenhouses, which includes tomatoes, basil and the next round of flowers, has begun. Crop Care (122 hrs): (3/4) Shade willows around the greenhouse begin to be trimmed. This task continues throughout the second week of March. (3/14) The introduction to pruning, tree anatomy, tools and shape of tree takes place. (3/18) The field walk with the first years is used to discuss mulching, remay details (ie: light and heat retention) and electric fencing operation. (3/20) With tree pruning nearly complete the focus shifts to the other perennials (blackberries, asparagus). Handling (2 hrs): Weekly egg washing, sorting, boxing and labeling. Marketing (5 hrs): Attendance of the Summit Farmer’s market meeting to discuss details and NSF location at the market. .
Special Projects (28.5 hrs): (3/5) Older flock separated from younger chickens to reduce infighting. (3/6) 17 chickens in total were slaughtered, cleaned and packed. (3/6 – 3/18) Trimming of the willows is completed. Week 1: A major snow events collapses the greenhouse. Week 2: With the ground still snow covered the week ends with an extreme wind storm and below freezing temperatures. Week 3: Warming weather brings 40 degree temperatures during the day but still freezing at night. Week 4: Freezing temperatures with heavy north winds threaten to remove the walls of the greenhouse and temperatures are consistently freezing during the day.